Creative Woodwork is West London’s high-end bespoke fitted furniture and cabinet maker. We specialise in custom built bedrooms, fitted wardrobes, alcove units, floating shelves, fitted kitchens, bathrooms, home offices and commercial out-fitting. Woodun Limited are purveyors of bespoke hardwood flooring. 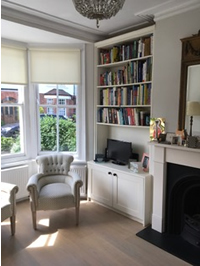 Having worked on prestigious contracts in 'shopfitting' for over 20 years, as both a joiner and a technical designer, I decided to set up my own joinery business with the main emphasis being on modern fitted wardrobes. Similar work is also considered. All work is made to measure with attention to detail being paramount. After sharing thoughts and ideas, a CAD drawing is produced for your approval prior to commencement of works. Please note these listings are suggestions from site members which we believe to have been made in good faith. We will not include listings of businesses or services which receive unfavourable reports from site members. The listings do not constitute a recommendation by Neighbour Net Ltd.